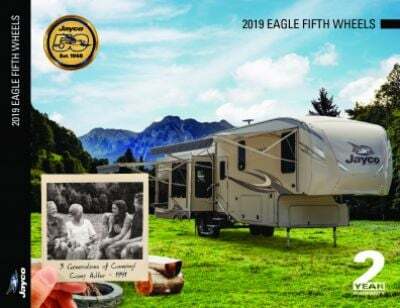 Go off on an adventure with the 2019 Jayco Eagle HT 25.5REOK 5th Wheel! At All Seasons RV, we're #1 in customer satisfaction because of our amazing inventory, super low prices, and fast, easy financing. As one of the largest RV dealers in the Midwest, we're ready to help you find the RV of your dreams and put you in it with a deal that will astonish you! Stop by today and explore our vast outdoor lot and our huge indoor showroom. We're located at 4701 Airline Rd Muskegon Michigan 49444 and we're ready to make your RV dream come true! Even if you don't live in Muskegon you can give us a call at 231-739-5269! Whether you live in Michigan or anywhere in the country, our fast, reliable door-to-door delivery means that you can have your dream RV in no time! You'll get up and go for adventure anytime you choose because this RV is very towable, with its hitch weight of 1375 lbs. and rugged GVWR of 9995 lbs. The 20' 0" foot patio awning will provide you with shade and comfort for outdoor living! Heat your home away from home in the winter with the 35000 BTU furnace, and cool it down in the summer with the 15000 BTU a/c. This RV has 2 slides and is 29' 1" long, 8' 0" wide, and 12' 1" high. There are enough roomy sleeping accommodations for up to 4 people. The master bedroom boasts a big, comfortable Queen bed that will ensure a cozy and restful trip to dreamland every night! You'll love cooking up all your family's favorite foods on the road because the full kitchen makes it easy to do! Whip up steaks, burgers, fish, or pancakes on the handy 3 burner range cooktop, while keeping fresh meats, veggies, fruits, and cold drinks on hand in the 8.00 cu. ft. refrigerator. Cleaning dishes is easy thanks to the 42 gallon freshwater tank. Don't trust that the communal bathroom will be anything but disgusting! 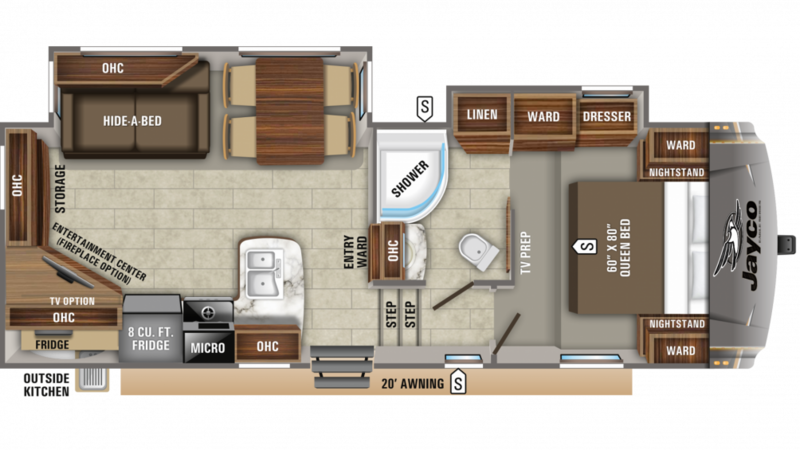 Enjoy your own personal bathroom, with a Porcelain Foot Flush toilet and a shower inside! With 60 lbs. of LP tank capacity heating the water, you'll be able to enjoy long, hot showers all vacation long! The 33 gallon gray water tank and the 33 gallon black water tank discreetly store dirty water and waste, so you won't have to see or smell it! You can treat your family to delicious outdoor meals anytime you choose, thanks to the wonderful outdoor kitchen!